Custom Storage Tanks | Modutank Inc.
ModuTank Inc. has a continuous history as a problem solver with the ability to rapidly deliver innovative solutions to difficult and unique indoor and outdoor liquid storage applications.We understand that businesses need custom storage tanks that are specifically designed, installed, and configured to meet unique industry requirements. We offer storage systems for chemical, wastewater and hazardous waste for a variety of firms and organizations in the environmental, commercial and agricultural industries. 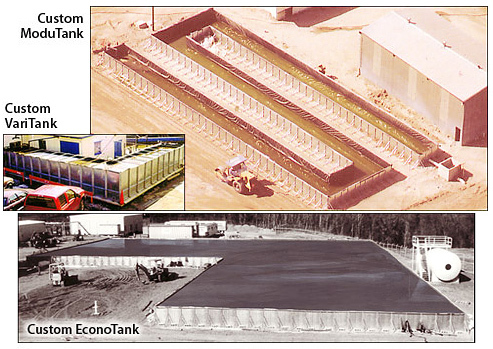 Our standard liquid storage systems include the ModuTank, EconoTank, ComPakt, ModuStor, VariTank, Terrastor, SpilGard, and QuickStor. These can be configured into virtually any aspect ratio, rectangle or custom shape, utilizing right angle corners such as a square, rectangle, “S”, “T”, “L”, “U”, “X” and other relevant shapes. This capability is especially useful for fitting tanks into irregularly shaped or constricted sites and for installations with special flow requirements. Moreover, these are also ideal for rentals and low-cost containment or emergency or short-term applications. Compact modular components are easily hand-carried by one or two workmen through doorways, windows, staircases and other small openings for rapid bolt-together assembly using common hand tools. No special skills are necessary. They may also be easily relocated and reconfigured if the need arises. Overall, this minimizes the costs that come with site preparation and installation. Our reservoirs are made out of high quality galvanized steel and capacities range from 50,000 to 2,000,000 gallons. Additionally, they feature leak detection systems and chemically resistant and potable water liners. We offer a wide array of systems that are built for a wide range of industry applications. Contact us for more information about our custom tanks.